Who says that trials and tribulations are a bad thing? I was called upon at the last moment to fill in for our preacher who had fallen ill, and I decided to present a ‘behind the scenes’ look at Revelation Chapter Seven, the subject matter of this post. You can listen to the message Signed sealed and Delivered. Chapter Seven presents a picture of two groups of people, one on earth and the other in heaven. In the sermon I describe a couple of the misinterpretations of the identity of these groups, so I am not going to repeat this here – suffice it to say that they are neither 144,000 Jehovah’s Witnesses, nor converted post-rapture Jews. Rather, the crowd on earth represent the church and the crowd in heaven represent Christians who have already died and are with the Lord. If you want more detail on how I come to this conclusion, then please listen to the sermon. The two key truths revealed in this chapter are, firstly, that Christians on earth are enduring ‘tribulation’, and secondly, that we are ‘sealed’ by the Holy Spirit during this experience so that we can learn and develop through this experience. Dispensationalists and some others teach that the tribulation referred to in Revelation is only something that will occur after Christians have been ‘raptured’ (snatched up into heaven) before the real trouble starts. But what does Jesus say about this? In speaking to his disciples about what would happen after he had left them he said: “I have told you these things, so that in me you may have peace. In this world you will have trouble. But take heart! I have overcome the world.” (John 16:33). The word translated as ‘trouble’ in the NIV is thlipsin, a Greek word rendered in many bible versions as ‘tribulation’. Paul and Barnabas understood what Jesus had meant by his use of this word because Acts 14:21-22 records that, ‘they returned to Lystra and to Iconium and to Antioch, strengthening the souls of the disciples, encouraging them to continue in the faith, and saying that through many tribulations we must enter the kingdom of God.’ (ESV). But here is the really good news! 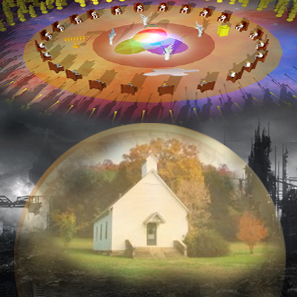 During our time in this School of Tribulation we are sealed by the Holy Spirit with the mark of divine ‘ownership’. The devil may afflict us, circumstances may batter us, ISIS may scare us…. but nothing in heaven or on earth can assault our spiritual identity – we are sons and daughters of the Most High God! I explain the origin of the ‘sealing’ concept in my sermon but you might like to read Deuteronomy 6:4-8 and Ephesians 1:13-14. The revelation of the church already in heaven sheds its wonderful light on the darkness of a world in tribulation, and it is the hope of being part of that glorious multitude that draws us through to our journey’s end. But we also have this light within us now. The anointing and presence of the Holy Spirit seals and signs us as Children of God; an anointing that protects our spirits and helps us to learn and practice love, faith, and hope in this present tribulation. According to Paul (4 Thes 4:16-17) the dead in Christ will only arise at the Second coming of Christ, so how can they already be with the Lord? Hi Mike – trust you are well. Paul Enns writes in The Moody Handbook of Theology’: ‘In this present church age, believers immediately go to God’s presence in heaven upon death’ (Luke 23:43 2 Cor 5:6-8 Phil 1:23-24 1 Thess 4:13-18). The ‘dead in Christ’ of 1 Thess 4:16-17 are those who are with the Lord in Heaven but do not yet possess their final material Resurrection bodies. So, with reference to 1 Thess 4, the ones Jesus brings with him from Heaven when He returns are those who have died between his Resurrection and 2nd Coming. The ‘sequence’ of the end of days as I see it is (1) Jesus Christ returns with all believers who have died ‘in him’, (2) The believers alive on earth at that time will be caught up to meet him/them, (3) all will be given material bodies (resurrection bodies) (4) The great judgement of all humanity will occur, (5) God will create a new HeavenEarth which will be the eternal abode of believers with Him. There is quite a bit of theology around all this which all major Systematic Theologies cover in considerable detail.